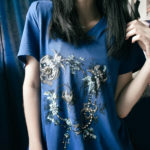 Bows, no gift is complete without one. I recently had to wrap a few gifts for birthday parties my daughter was invited to and I was a little bit shocked at how much bows cost. Maybe it’s because I am a crafter and every time I look at something I try and figure out how I can make it with items in my craft stash, but $3 for a bow seemed a little high to me! Using scrapbook paper or extra wrapping paper, you can create DIY paper gift bows for a fraction of what stores are charging for them. 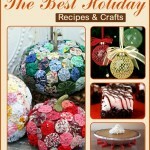 Plus by making your own bows, you can customize them to match your gift or project. 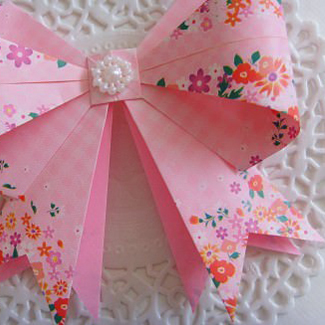 Bows have also become a popular embellishment for paper crafting projects. 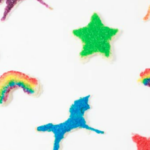 From DIY greeting cards to embellishments for scrapbook projects, bows are popping up throughout the paper crafting world. You can also dress up your next party with gold glitter bows in a variety of sizes. 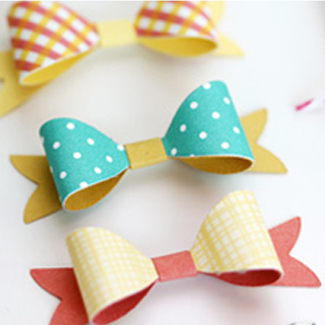 To create the bows from the tutorials I am sharing here you basically only need 1 supply: paper. 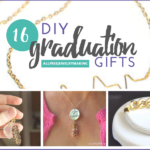 From patterned scrapbook paper to crepe paper and even old magazines, I am pretty sure you have the supplies on hand to create your own bows without spending a dime! 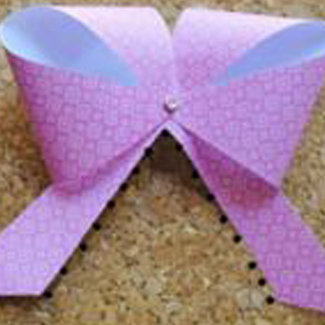 Quick start your bow making with this free paper bow template . 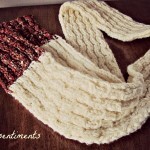 Too cute two toned bowties are just…too cute! 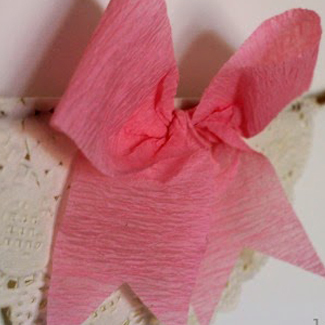 Create either feminine pretty pink bows or masculine bow ties out of crepe paper. 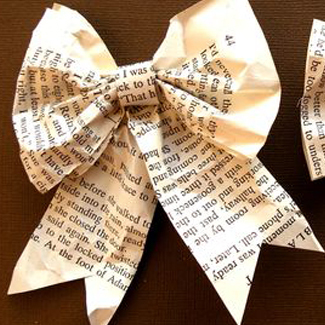 Up-cycle vintage books into these vintage inspired paper bows. 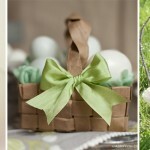 Recycle magazines to make these eco friendly bows. 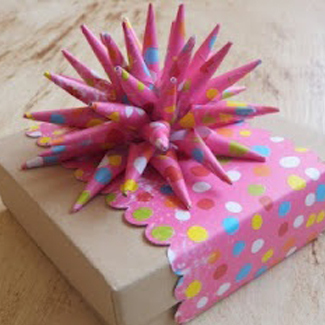 Your next gift will make a point when adorned with a paper spike bow. 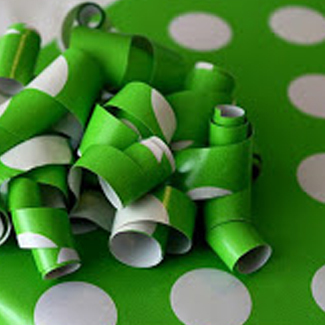 Wrapping paper bows are fun, festive and curly! 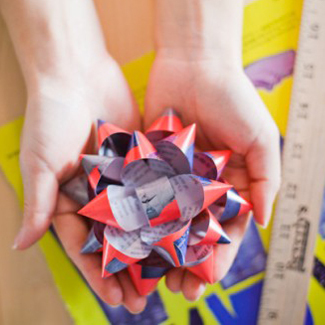 These origami bows would be the perfect embellishment on cards or scrapbook layouts. 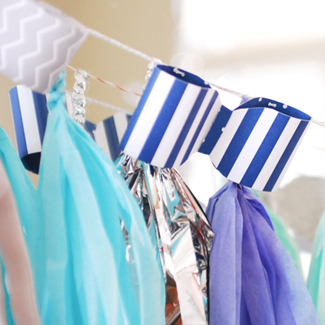 Decorate for your next party with this paper bow tie garland. 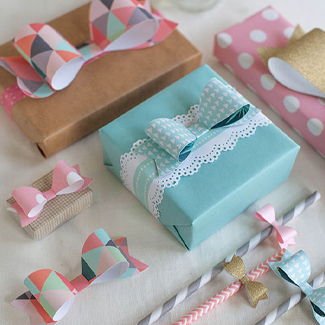 Score, cut and fold your way to these simple paper bows. 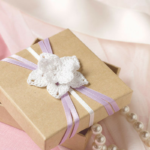 Gift box or gift bag, how do you wrap your gifts?